Streaming and Watching Soccer on fuboTV. The ultimate soccer, sports and entertainment streaming service in the USA. Stream and watch all 64 World Cup Matches live and on-demand on fuboTV. Get full details here. fuboTV is an over-the-top (OTT) content provider that feeds its subscribers with extensive high definition sports coverage and entertainment programming, without compelling them to pay for a cable bundle. 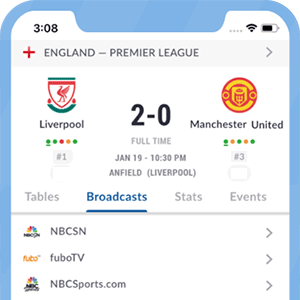 The list of channels on fuboTV has kept growing since the platform was first introduced in early 2015, and access to major sporting leagues and tournaments has become wider and easier. What Soccer leagues and competitions can I watch on fuboTV? What soccer leagues and competitions does each Channel offer on fuboTV by Channel? Note: Benfica TV (BTV) covers only matches featuring Portuguese side Benfica. What are the Key Features of fuboTV? Upcoming broadcast schedules for each network. View the list of upcoming LIVE matches available on fuboTV. Browse upcoming matches by date, channel, league or club. You can easily browse what’s available to watch for the coming weeks and flag your favorite matches with the handy reminder feature. fuboTV offers a convenient DVR feature for when you cannot watch the match live or would like to save it for later. This feature comes with all packages and includes 30 hours of free Cloud DVR storage. If you require more hours of Cloud time, you can upgrade to the Cloud DVR Plus for $9.99 per month which will give you 500 hours of storage space. fuboTV is available on the most popular platforms, offering a comparable experience on most platforms. A new iPad app was designed and launched in March 2016. It included new features like Chromecast, picture-in-picture (browse the web while watching), chat, DVR, viewing reminders, on-demand content and an EPG. The user and viewing experience on the iPad has been optimized and tailored to the ultimate fan user experience. In our case, we have most of these devices laying around the office, and we tend to use fuboTV on whatever device is most at hand. The beauty of fuboTV is the portability of the viewing. So, whether you are at home, at the office, stuck in traffic or at a coffee shop, you can conveniently access the programming on fuboTV. fuboTV offers subscribers billing and technical support via email, chat and phone support. Yes. 30 hours of programming with no expiration period. Upgrade option: DVR capacity of500 hours for $9.99 / month. *Got itLive Soccer TV does not provide fuboTV live streaming. The information provided on this page is simply fuboTV soccer TV schedule.